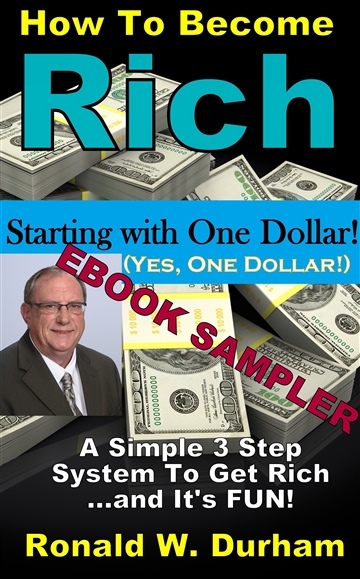 Download now to read more about Financial Farming, and discover how to get WEALTH and ABUNDANCE from the time-tested strategy of a successful entrepreneur, Ronald W. Durham! I have always had the spirit of an entrepreneur. I have always had a sense of independence. I have held many jobs, many capacities in many different environments. I was miserable at every job I ever had. I hate those things. I have to do my own thing. I always felt that I was capable of doing more than my jobs required. Sometimes, doing my own thing worked in my favor, sometimes it didn't. I've almost always been able to make more money on my own than I did working for someone else. Although, it never mattered how much money I made, I always ended up broke again. I never did anything extravagant. I didn't have any addictions. I lived life on a conservative basis, but I still went broke again. My most successful business lasted for several years. Towards the end of this run, I discovered that I was deeper in debt than ever before. When this gig slowed down, I was broke again. It took decades for me to figure out why I kept going broke. When I figured it out, I realized that many other people could benefit financially from this "missing link." I haven't been broke since I discovered this mysterious and elusive "missing link", I hope you use it and become rich.